King's Tacos has been serving up Mexican fare in Toronto since the early 80s, though not always at its current location. The somewhat spartan restaurant, often packed, rightly takes pride in its authenticity, but what really stands out are its enormous portions and meaty offerings. 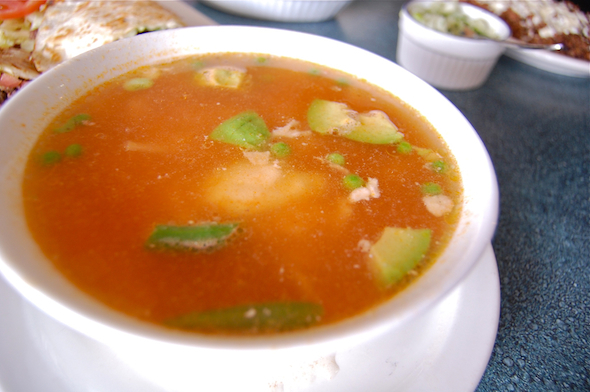 Everything at King's Tacos is gigantic, starting with the soup. Fortunately the Soupa Azteca ($8.90), a rich and meaty chicken soup, is not only huge, it's delicious. The hearty broth is larded with buttery avocado, crunchy tortilla strips and tender, flavourful chicken, and touch of sour cream adds depth and and pleasantly sour contrast. A frozen vegetable mix of corn, carrots and peas is the only unnecessary note, though it doesn't detract from the dish on the whole. Tacos ($9.50-$14.50) are DIY style, so we're presented with steamed tortillas, heapings of cilantro and onions, lime wedges and an array of delicious sauces - jalapeno, red chili and chipotle. These toppings are then decidedly upstaged by the staggering amounts of meat that come out moments later. 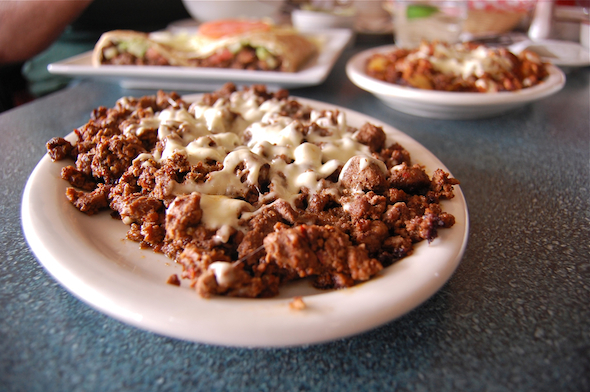 The Fortachon is a mix of beef and chorizo topped with cheese, almost like a Middle Eastern mixed grill. It's hard to describe beyond "meat," but put it this way - if you like beef, you won't be disappointed. The King's Special is, if anything, even meatier. 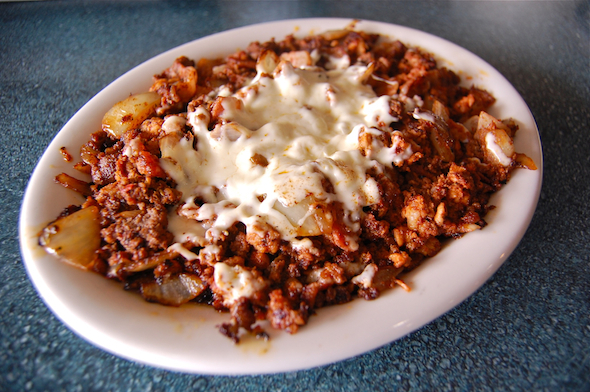 Combining beef, pork, chorizo, and bacon along with a topping of cheese, it packs a serious wallop. Pairing the tacos with the lime, onion and a cilantro is not just a good idea, it might be the only way to save yourself from meat overload. 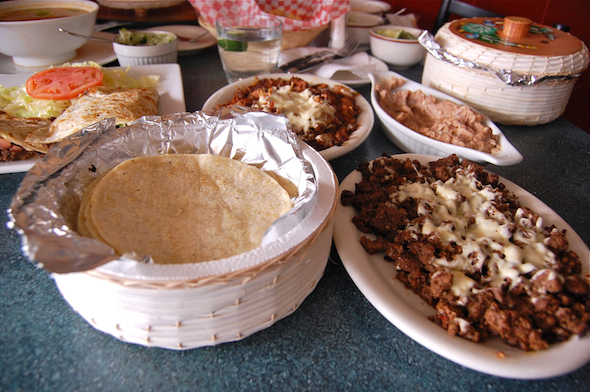 And if that isn't enough, sides like rich and flavourful refried beans ($5.50) are also available. 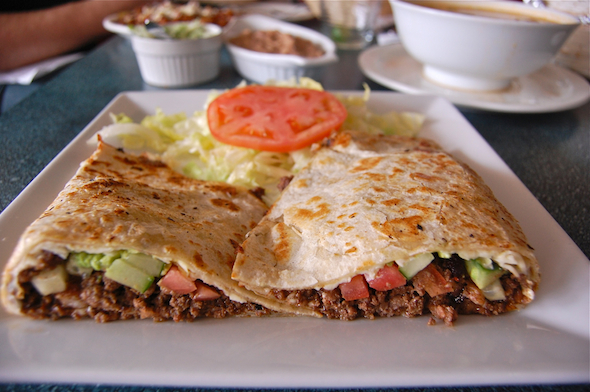 Quesadillas also appear on the menu, and we decided to sample the Montado Chihuahua ($11.90), a mix of cheese, bistec (beef), fried beans, tomato and cucumber. Like our other dishes, this one was seriously heavy, as the meat and the plentiful cheese combine to overload their warm, slightly crispy tortilla wrapping. Tomato and cucumber are helpful in adding some needed balance, but make no mistake, this greasy, meaty dish ain't for the faint of heart. King's Taco, with its old school, grease and meat heavy menu may not be in keeping with the more trendy taquerias that seem to dominate the Toronto Mexican scene. Don't let that fool you - the food is authentic, and more importantly, good, and the portions are gigantic. We barely finished our meal, and all decided we would never eat again. We'll see how that goes.